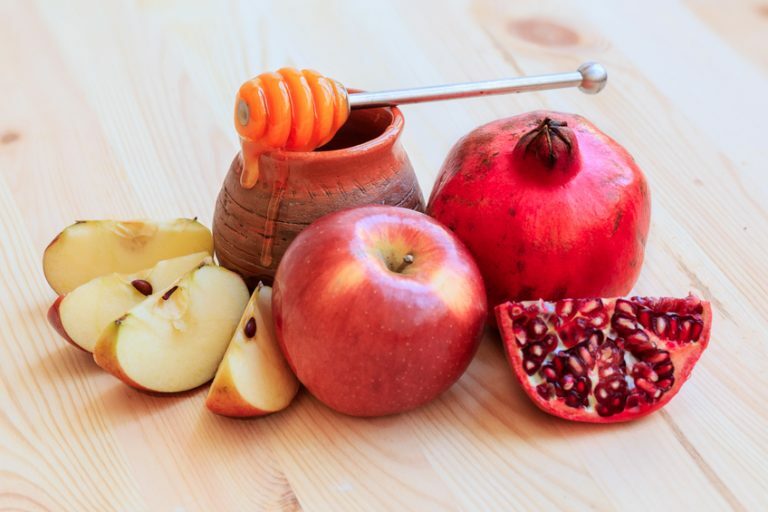 OU Kosher presents popular Q&As in preparation for Rosh Hashana. Additional questions can be asked by contacting the OU Kosher Hotline (212-613-8241) or by submitting them to kosherq@ou.org. Alternatively, CHAT LIVE with an OU Kosher expert on www.oukosher.org via the chat icon located at the bottom right-hand corner of the screen. A: Before eating the honey dipped apple, one should say the usual bracha over fruit (ha’eitz). Then, to avoid speaking unnecessarily between the bracha and partaking of the food, one should take a bite of the apple before reciting the yehi ratzon (Mishnah Berurah 583:4). This applies to the yehi ratzon for challah, which is also dipped in honey, as well as any other fruits/vegetables that will be served for the purposes of a yehi ratzon. It should be noted that if any of those other fruits is a member of the sheva minim (seven species attributed by the Torah to the land of Israel), they should not be brought to the table until after partaking of the apple. A: Some people do not eat nuts because the Hebrew word for nut is egoz, which has the same numerical value as chet (sin). Furthermore, nuts have a predisposition to cause an increase in saliva and mucus which may disturb ones concentration during prayers. (Rama O. C. 583:2). Others have a custom not to eat sour or bitter foods such as sour pickles (Matteh Ephraim, 583:3). A: The minhag applies to breads, cakes, pies, pretzels and crackers. (In technical terms, it applies to all pas habo bikosnin.) For an in-depth explanation of pas habo bikosnin, see The Mezonos Roll, Is it a Piece of Cake? A: Yes. A pie shell fits into the category of “pas ha’bah b’kisnin” (refer to OUKosher.com article mentioned above for a definition of this term) and therefore should also be Pas Yisroel. However, if one purchases pie shells that are not fully baked, then they will become Pas Yisroel when one completes the baking process. One should not use non-Pas Yisroel graham crackers to make their own pie shells.. Those pie shells that require further baking before being consumed become pas Yisroel. A: Yes, bread crumbs should be Pas Yisroel as well. There were poskim who were lenient regarding bread crumbs that are used for deep frying. This is because frying is a different process than baking and the deep frying is viewed as the completion of the bread crumb preparation (see Teshuvas Avnei Nezer Y.D. 100). Since this is a matter of dispute, unless there is a pressing need, Pas Yisroel bread crumbs should be used.